Supports editing NES, SNES, Genesis, PCE, GG, WS/C, GB/C, MSX 1+2, NGP/C, SMS, and GBA graphics. This is the C++ version. A newer C# version is also available. The two versions differ in available features and included content. This is overall the best hacking tool there is for graphics on the NES (and other systems!). It is my tool of choice for making and editing graphics. It has a nam editor, so if you’re homebrewing you can open your uncompressed nam here. I find that mastery of this process is a must for high level graphics hacking. I even use it for debugging, since I can copy/paste any part of the ROM, not just the graphics: For this you need to have a working version of a ROM and a bugged version. Then copy some chunks of the good ROM and paste on the bad ROM (copy the code tiles as if they were graphics) and save the bad ROM. Keep doing this while testing the bad ROM until it works. Sometimes I use that method to pin point where in the ROM is the part of the code that is causing a certain bug. It helps to keep many versions of the ROM as you work on it for your hack because old bugs may not be noticed until later on. 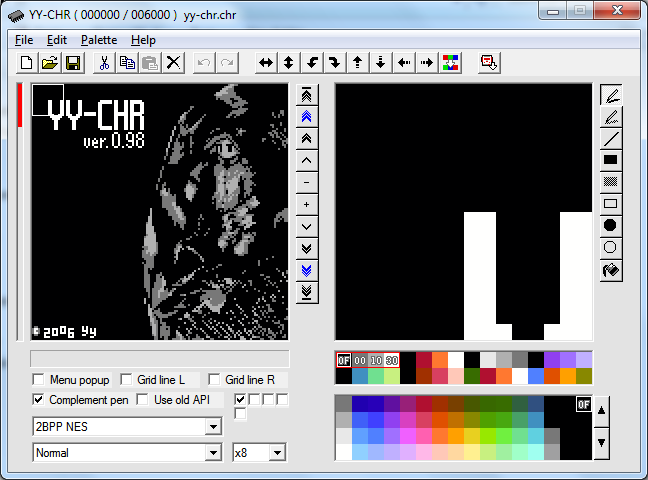 All in all, yy-chr lets you do whatever you want to any file, because In the end it’s a raw visual hex editor with some welcome extra functionality. Highly recommended for hacking.